Have you looked at the Uber or Amazon app on your phone in the past week? Chances are that you have. Congratulations, you’re a part of the phenomenon that is the rise of tech. Real estate is no different. Proptech is the acronym used to describe any technology that is set to disrupt the real estate space. This can include software, hardware, materials or manufacturing. Hiring the right talent is critical for any business to succeed. Companies must focus on both the technical know-how of a candidate as well as their belief in the company’s value systems, which eventually helps in setting the culture of the organization. We used to compare Entrepreneurship to running a marathon. However, over the years we have learned that it is more like an ‘Ironman’ race (3.86 km swim, 180.25 km bicycle ride and a 42.20 km run). Not only will you need to grind it out like an Ironman, but you will also need different skills during this journey. Invest with a Reputed Developer: Investing with a developer who has a proven track record always pays off, even if you have to pay a premium for the Asset. An entrepreneur is bound to make mistakes throughout his/her journey. However, the lessons a leader can learn from a mistake are invaluable. Entrepreneurs in their learning stage make plenty of mixed decisions – decisions related to hiring, investing in wrong projects, overspending, taking on more work than they can handle. Indian Real Estate Sector Outlook - What to expect in 2019? Instead of looking at real estate as a whole, it should be seen from the lens of the different asset classes within Real Estate. Every Facility Manager should be well-versed with the guidelines for fire safety. Hiring the services of the right Facility Management Company is of utmost importance for the longevity and maintenance of a building. “Sila Has Provided The Launchpad To Aim Higher In My Life” – Vinay Gangan, Asst. Manager – Procurement, Sila. Employee(s) are the biggest asset in any organisation. Sincerity, honesty, productivity and mutual trust are essential qualities to be possessed by them. Not only do they work hard, but they also work smart. “Sila Is Responsible For My Exponential Growth” – Dinesh Gupta, Manager – Accounts & Finance, Sila. “Sila Has Helped Me Grow As An Individual” – Raghav Kapur, Region Head – South India, Sila. When you are planning to sell your house, you definitely would want to look for the best possible rate from the sale. Let us look at a few economical ways to upgrade your house which indirectly would upgrade the value of it. Every building – be it residential, commercial, schools, hotels, restaurants and hotels, produces substantial amounts of materials and waste. Hence the facility team needs to focus on managing the same in the most optimum manner. Many industries have nowadays started adapting tech in order to increase efficiency and accuracy of the business. One of those really fast growing businesses after real estate sector is Construction, which is going to get crowded in the next two years. ‘Honesty is the Best Policy’ was a case well proven by one of our own who is deployed currently at Terminal T2 in Mumbai International Airport. Suman Dhoiphode when she returned diamond rings worth lakhs to their rightful owners last year made us believe again in today’s world that “Honesty is the Best Policy” indeed. Real Estate is one of those many fast changing businesses, especially in India now, since GST took place. We expect the impact of Demonetization, implementation of Real Estate Regulatory Act (RERA) and Goods and Services tax (GST), to have a significant impact on the Real Estate sector. HR (Human Resources) professionals get a lot of questions from the male team members on the non-existent father friendly policies which brings up the question that a lot is being spoken & written about women’s role as a parent. However, what is under-played many-a-times is the role of men as parents, which holds an equal importance in the growth of a child. There are a number of myths about a facility manager. Modern office environment has evolved dramatically over the past few decades, roles and responsibilities are drastically changing, but unfortunately our concept of a facility manager has not changed. We still consider these professionals as someone who flies under the radar, who is unseen and less sociable as compared to the other roles in the real estate services sector. A milestone is a hard and fast due date that represents a major accomplishment during the course of the project that is being managed. Sometimes these milestones represent the approval of a major component in the project, like approved testing of the product for release one. CM&D SILA‘s relationship is exclusive to the owner as they act in the client’s best interests at all times; providing comprehensive management at every stage of a project. Whether it is in the creative stage starting with a concept, and project definition to the completion of construction and turnover of a quality project on budget and on time. Delving deep into what inspires her and drives her ahead at work. The year 2006 witnessed a momentous change for the airports in India with the privatization of Mumbai’s GVK Chhatrapati Shivaji International Airport (GVK CSIA). In order to achieve a global standard, GVK CSIA has partnered with well-known international experts for airport design and operations. Facility Management businesses form a part of the service sector, and it is plagued with issues for the human resources teams to manage. Organizations have huge diversity across employees, owing to the geographical, nature of isolated sites and lack of competencies which allow communication gaps to be bridged. What makes technology in facility management industry a value added to their services ? Though this may not be exclusive for the facility management sector in India, a Gallup study highlights how employees who make the most of their strengths in their workplace, are six times more likely to be engaged than their colleagues who seem to be lost on this crucial alignment. As the world becomes increasingly connected, it offers organizations in the facility management sector an opportunity to engage with an employee at an enhanced level. Today’s teams seek job fulfillment and are keen to work for organizations which are known for their employee friendly policies. SILA, being one of the leading and the fastest growing Facility Management service providers in India, focuses on training, standardization, and human resource management has allowed us to build best in class processes and systems to better optimize our service delivery. SILA provides professional housekeeping services in India. CM&D SILA’s expertise is in mediating construction disputes, which expedites the schedule and minimizes delays and cost overruns – all projects in India to date have been examples of where capital market client have brought in CM&D SILA to expedite or take control of the project in order to ensure timely delivery. For anyone involved in project delivery, it highlights how understanding the customer’s goals and requirements from the very start, has the power to either make or break a project. Being in the Facility and Construction management business, its highly essential for us to understand customer service in all detail. Back when SILA started with facility management operations in April 2010, we had not expected that our culture would eat our strategy for breakfast. the fact that is has, speaks of our inclusion in the global movement that is revolutionizing work cultures. Being in the services business comes with its own basket of wins and challenges. Facility management remains as core business for SILA. SILA is the one of India’s fastest growing facility management providers – with clients ranging from the pharmacy giants, premium commercial properties, exclusive gated communities to highly respected real estate developers. What has truly contributed to the growth is our focus on key differentiation, which leads to a superior customer experience. On 3rd March 2014, the Property Times carried the following headlines which led to the birth of our new company. SILA and Construction Management and Development Inc. (CM&D) have formed a joint venture – CM&D SILA Development Services India Pvt. Ltd. – to provide Project Management and related services for Real Estate development projects across India. 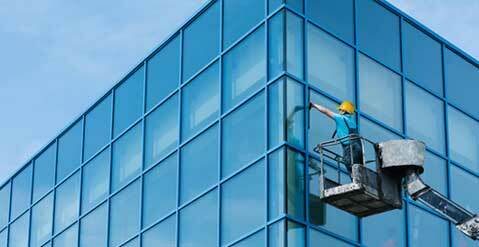 Facility managers face many challenges each day. From maintenance issues to working on long-term energy efficiency goals, there is a lot to worry about when your job title is Facility Manager. So what are some of the most common and most difficult challenges for a Facility Manager?